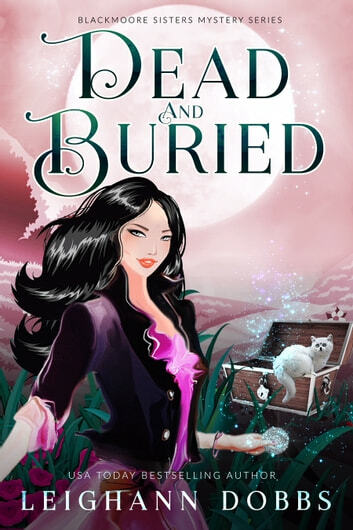 Summers in the seaside town of Noquit Maine are quiet and relaxing ... unless you find a mysterious dead body, a hunky ex-boyfriend shows up and you start getting instructions from ghostly relatives. That’s exactly what happens to Morgan Blackmoore. Suddenly, she finds herself in a race against time as she’s launched into a dangerous treasure hunt that pits her against modern day pirates who think she has the key to a three hundred year old secret. To complicate matters even more, one of her sisters keeps talking to the ghost of their dead grandmother, another has crystals with unusually powerful healing properties and her cat has an uncanny habit of showing up in exactly the right place at exactly the right time. Not to mention that her ex-boyfried, Luke Hunter, suddenly shows up in town after ten years of being overseas and claims to want to help her fight off these deadly pirates, but Morgan finds herself fighting her attraction to him instead. Will Morgan outwit the treasure hunters and find the real killer before Sheriff Overton puts her in jail? And what about Luke, is he really a good guy or just after the treasure himself? Sounds like Red Rackham's Treasure, with a twist, the four girls seems like witches, the good kind; at the end of this story, the treasure has yet to be found, what they found is a clue which will only be reveal in the subsequent story; an adventure, a mystery, some romance, nicely mixed to form a great story; this story is good on its own because part of the beginning actually give a brief of their run in with that idiotic sheriff who seems intent on pinning the girls with murder. What do you get when you mix the Blackmoore Sisters, a pirates treasure, treasure hunters, other people after the treasure hunters, and an unscrupulous sheriff Overton that will do anything possible just this side of legal to put the sisters in jail. Oh yeah, and possible frenemy from Morgan's past? You get a wild tale from Leighann Dobbs that you don't want to put down. This story has adventure, danger, and plenty of laughs. Well defined characters and a solid plot line. Just like the first book, I really enjoyed it. The characters & story plot are just terrific. Cant wait to read book 3.